It was circa 1982 and I was working for Florida Pump Service in Orange Park Fl as the VP and General Manager. When the club went out of business, Mark (the owner of Florida Pump Service), either bought the car or removed it at his expense. He took it to Orange Park and put it on a vacant lot he owned. His plan was to make it a meeting place for a women’s club that his wife belonged to. Neighbors complained and the plan never came together. Mark moved the car to his 2nd Store in Springfield where it sits today. Ionia Street just north of East Eighth Street, New York City subway car rusts into the humid Florida muck, filled with junk, lost in the Eastern edge of the neighborhood of Springfield, really more Phoenix than Springfield, Phoenix blurring into Fairfield, Oakland, and East Jacksonville. 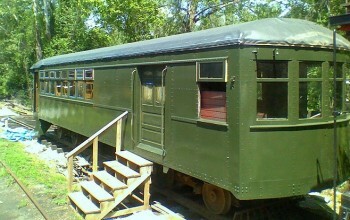 The American Car & Foundry Co built subway car no. 983 in 1935. The car is more than 60 feet long and weighs just under 84,000 pounds. Every now and then a hustler or a dealer or a neighborhood activist or a hobo taking a grocery cart full of bottles to the recycling center by the railroad track sees through the blue plastic paneling on the chain link fence and wonders why the subway car is where it is. No. 983 is filled with stacking chairs and old boxes. A late 1960s or early 1970s flyer linvites you to “shop or browse” at an antiques show in Madison Square Garden, admission only three dollars. One could note ironies. That Jacksonville has an all but nonexistent public transit system, comprised of buses on inefficient routes and buses designed to look like trolleys. Such buses seem to mock the streetcar system that once connected a smaller Jacksonville. The neighborhoods built to provide housing for railroad workers and streetcar workers are now shambles. That, besides the Skyway system that loops a car at a time around a concrete track over downtown and connects next to nothing and which almost nobody uses, the only commuter railcar found in Jacksonville is the one rusting into the earth in a forgotten naborhood, one that seems to have gone terribly off course from its lines in NYC. Hap worked for the disco club chain Nichols’ Alley for the second half of the 1970s. In 1977, he went to a junkyard in Coney Island to look at trashed subway cars and find one to send to the new dance club about to open in North Florida. He sat with the car as a huge crane lifted it in the clanking industrial night onto a flatbed truck. He drove down Interstate 95 from New York to Florida, accompanying the flatbed with “Wide Load” signs. Late at night in Sacramento, a lonely man posts a question into the World Wide Web, wondering if anybody out there remembered the 1970s at Nichols’ Alley in Jacksonville, Florida. 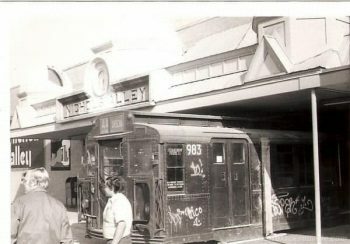 Car 983 was inserted into the dance club itself, with the front of the subway car protruding from the front of the building. The club’s ticket booth was the former engineer’s compartment. You came into the club through the front of the subway car, then walked out the car’s side doors onto a platform from which steps descended onto the dance floor. Nichols’ Alley was located at the northwest corner of Beach Boulevard and University Boulevard in the K-Mart shopping center. Shelley later said she cut her disco feet at Nichols’ Alley and celebrated her eighteenth birthday there. It was the hottest spot in the city in its day. All that’s there now is a vast gray, gray, gray parking lot in the gray whir of gray cars. In the early 1980s, when the club went out of business, the owner of Florida Pump Service, Inc. in the suburb of Orange Park bought the subway car and moved it from Beach and University to a vacant Orange Park lot. Neighbors complained. Not In My Back Yard. So he moved the car to an alternate location in East Springfield. Unfortunately East Springfield and Phoenix exhibited no NIMBYism about much of anything by the early 1980s, comforming to that universal law that cities dump the most unwanted services on their poorest residents in the poorest neighborhoods. 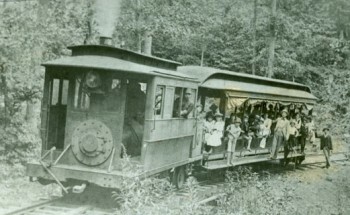 Subway car number 983 was surely the least of the ills the poor urban neighborhood would complacently accept. April 2, 1977, Billboard magazine. “Disco Chain Reimburses Cities for ‘Goodwill,’ Nichols’ Alley Strives to Upgrade Club Image,” by Radcliffe Joe. “Community activities in which Nichols’ Alley has been involved included grants for the development of theatre, arts, and other activities, fashion shows with all proceeds going to the local Girl Scouts,” and proceeds of other shows going to the United Way. The wheels are gone. The subway car is completely trashed. It sinks into the soil. It rusts into the earth. It lived these various lives. It pulled commuters through the biggest city in the country. It admitted 18 year-olds into the largest disco dance floor in Florida. It passively let the hot wet earth reclaim it on the border of the Springfield and Phoenix neighborhoods at the northeast edge of downtown Jacksonville, Florida, filled with junk, for 30 years.